Challenge Jr is led by Adult Leaders, with the help of teen mentors. We have a complete Annual Program of Materials and Curriculum to help the girls and leaders successfully participate in the programs. The curriculum is virtue centered and includes both large group and smaller team activities. Challenge Jr is a great way to give the girls an opportunity to meet new friends. 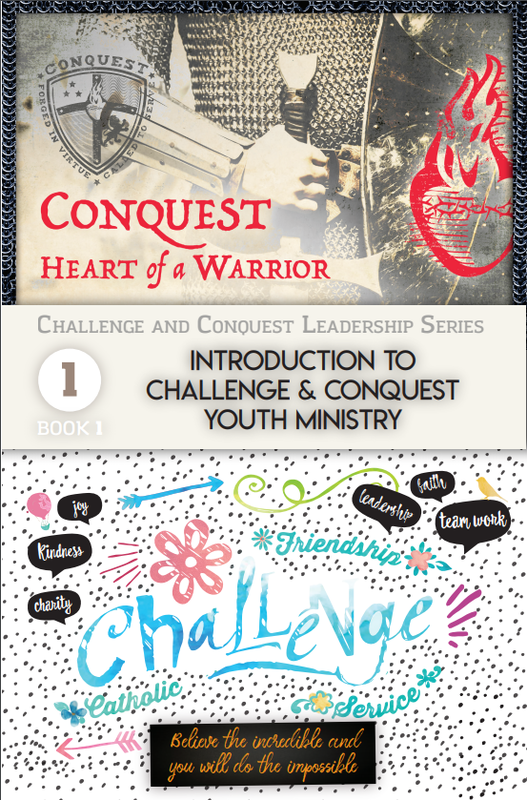 The Challenge Jr curriculum guide in the leader kit focuses on five virtues each year. 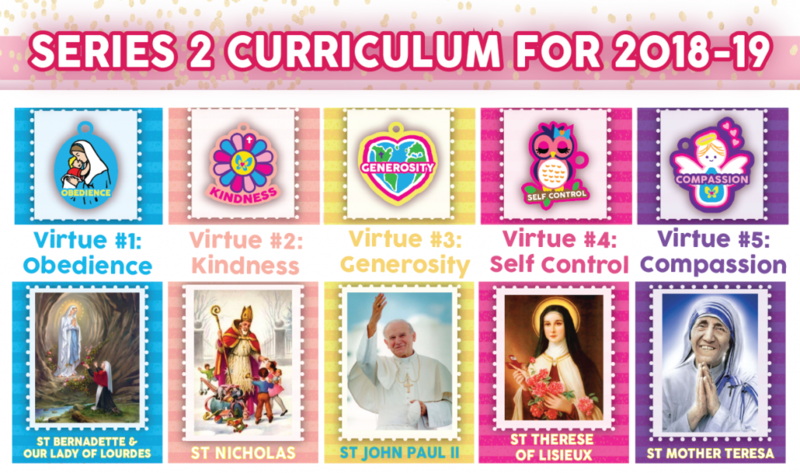 Each virtue has four weeks of curriculum, which focuses on living that virtue with God, with family, with friends, at school in the corresponding week. Each virtue has a saint role model that the girls can learn about. The story of that saint will be carried throughout the 4 weeks of meetings by showing a video or telling a story about their life. There are 3 years of Challenge Jr Curriculum. For 2018-19 we are using the Series 2 Curriculum. 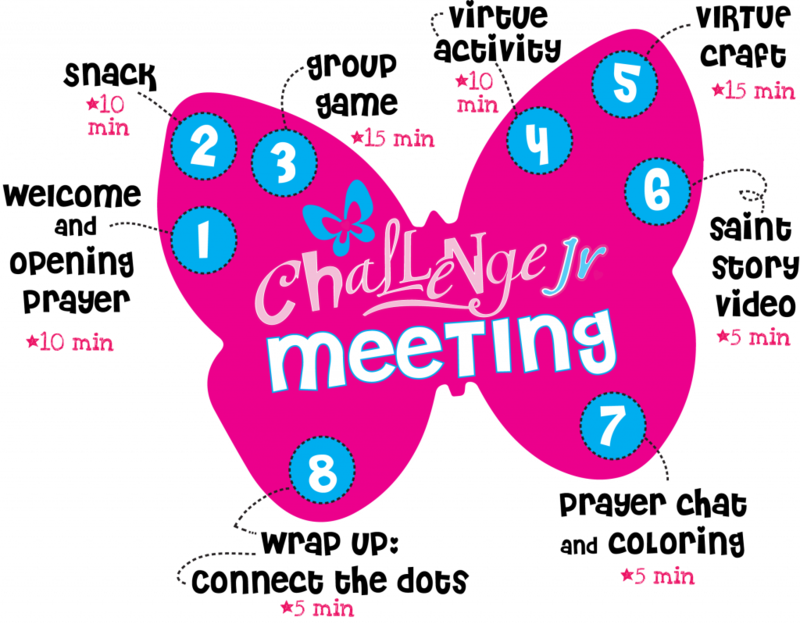 The Challenge Jr Weekly Meeting has 8 different parts. There are moments for fun like the snack and group game. There are moments to learn about the virtue of the week and the saint story. The girls will also learn about one Catholic prayer. There is even time for a virtue craft, all centered around a common theme. The Challenge Jr Leader Kits contain all that the adult leader needs to run Challenge Jr. The most important item in this kit is the Challenge Jr Leader Curriculum Guide with the weekly activities. The Leader kit also includes sample packs of the 5 charms and bracelets, 5 virtue posters, 300 pack of virtue stickers, Challenge Jr Leader USB, a 20 pack of the NEW Challenge Jr brochure, Challenge Calendar, Prayer book, Challenge Jr member book, Challenge Jr member card, bracelet, holy cards, pen, journal and key chain. The member kit has everything a Challenge Jr girl needs for her meeting – Pink Cinch Bag, Member Card, Member Coloring Prayer Book, Challenge Jr bracelet, calendar, holy cards and pen. The Challenge Jr Member Card is new and has five panels where the girls can put their sticker and jot down what they have learned about the saints.The Challenge Jr Prayer Book is a coloring book that not only has the essential Catholic prayers but it also includes pages about each virtue. Challenge Jr T-shirts are available in adult and youth sizes and are sold separately. When the girls join Challenge Jr, they receive a member kit with a Challenge Jr bracelet. Each time they complete a 4 week session on virtue, they receive a charm and bracelet that goes along with that virtue & saint. This year the virtues and saints are Obedience (Our Lady of Lourdes), Kindness (St Nicholas), Generosity ( St John Paul II), Self Control (St Therese of Lisiuex) and Compassion (St Mother Teresa). The charms and bracelets are sold individually on the Challenge store. 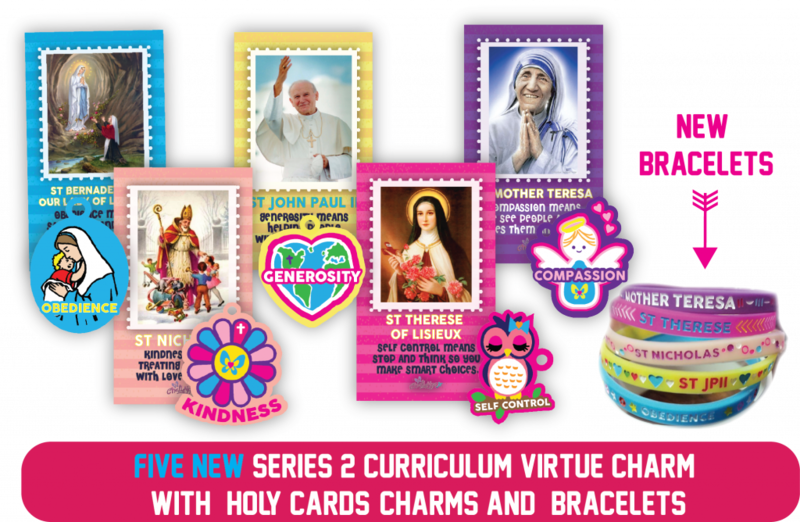 The Challenge Jr Virtue Charms are a complement to the program and come with a virtue charm and bracelet in a cute organza bag with a holy card about the virtue and saint. The Leader kit has a sample pack of each charm included. If you have a Challenge Club Annual Membership for 2018-19, its very simple. Just go online to the Challenge online store and purchase the Challenge Jr material. If you do not have a Challenge club and are just starting, you will need to visit the Mission Network website to purchase your annual membership and you will receive an email with access to the online store, coupons for free Challenge Jr items and instructions. Visit our Challenge Junior Online Store or Challenge Registration Site to get started.